The most romantic day of the year is fast approaching, and you’re probably starting to think about what to get your significant other. Candy, flowers and chocolates are typical Valentine’s Day gifts, but we think a refreshing way to show love for your special person is to give them something that can make their life easier or more fun. Are you in a long distance relationship, or perhaps you and your loved one travel a lot? The Logitech TV Cam HD is a thoughtful gift that will bring you two closer. With built-in Skype and Wi-Fi connectivity, you can share everyday moments on the biggest screen in the house. All you need is an HDTV with an HDMI port as well as Wi-Fi or Ethernet Internet connection. 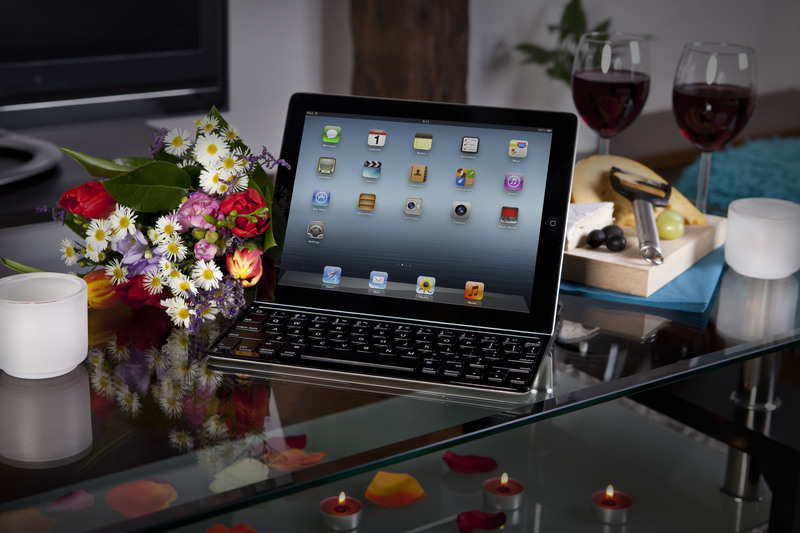 You might be your girl’s other half, but perhaps she’s interested in finding the other half for her iPad too. The Logitech Ultrathin Keyboard Cover is the sleek companion for her tablet. As the name suggests, it acts as a cover for protection, a keyboard for easy typing and a stand for hands-free enjoyment, plus you can have it engraved with a special message just for her at no additional cost. If your girl loves music, then the Logitech UE Mobile Boombox is the perfect gift. Bring this tiny speaker along with you wherever romance takes you this Valentine’s Day, and enjoy sharing your favorite songs together. Don’t forget a playlist of music the two of you love to make the gift complete. Simplify your man’s life by giving him the Logitech Harmony Touch. This universal remote features an intuitive touch screen to give him control of all his home entertainment options. With 50 easy-to-customize channel icons, you and your man will be able to access all of your favorite shows with a simple tap. Is your man a gamer? The Logitech G710+ Mechanical Gaming Keyboard and Logitech G600 MMO Gaming Mouse are the high performance accessories for his favorite activity. When it comes to the G710+ he will be impressed by the high-speed, mechanical keys, and we’re sure you’ll love the whisper-quiet keys too. The G600 offers total personalization he’s sure to enjoy during those intense player-versus-player sessions. With twelve thumb buttons, g-shift function and a comfortable, sculpted shape, this mouse is specifically designed for easy no-look navigation and faster game play. Let us know what you choose for your love in the comments below!